Tsw + Lirr = 24/7 Railroading! Discussion in 'Dovetail Live Article Discussion' started by TrainSim-James, Oct 26, 2018. The always-bustling Long Island Rail Road is coming soon to Train Sim World! Out of curiosity, will this route be merged with the NEC route if we already own it or will these be separate routes? But this RIGHT HERE.. WOOOOOHOOOOOOOO.. YESSSSSSS!!! Wow! It looks really good! Nice job! I was prepared to skip this route, expecting a US freight one. Have to say, I'm pleasantly surprised. This will be a new experience for me. I know next to nothing about LIRR, what kinds of services are there and which will be included in the Scenarios or Service mode? Are there fast/stopping services or is every service a stopping one? Will the in-game route also include moves to/from depot? Bruh.. don't.. The fact that this was introduced in a much better-looking game, is a fantastic Introduction to this. It could still come to TS at some point, which I also hope it will. Well, either way, should just be glad it came to a train simulator, after such a long time. Omg LIRR finally! This DLC looks absolutely amazing! Wait... did DOVETAIL LISTEN TO THE COMMUNITY?! WHAT SORCERY IS THIS?! I'm looking forward to this one- it even includes branches! All the TSW routes before this one have been strictly just one route, save for NEC. This is great! -This next one is more annoying to me, but this could just be because the route is WIP: no crossing signals? Really? That's noticeably worse than the nonfunctional ones in the last few routes! You can't just skip those! How hard can they be?! Overall, though, I'm looking forward to this one. The quality of the route looks like it will definitely make up for the small selection of rolling stock, and I'm sure the crossings will get sorted out before release. Pictures looks great looking forward to it, since it's also uses an small part of the current released Nec could this be possibly merged? Would be epic to play an 24 hour session where you can switch between amtrak and Lirr lines while playing on the same map. They probably reworked Penn Station and the area around Sunnyside yard. So, the DLC is likely going to be a stand-alone, rather than it being merged with the NEC NY, DLC. Fix the old stuff first. Still so many bugs in the old addons. Lot of people spent a good amount of money in those DLCs and looks like you rather pump out more DLC than actually supporting the existing stuff. 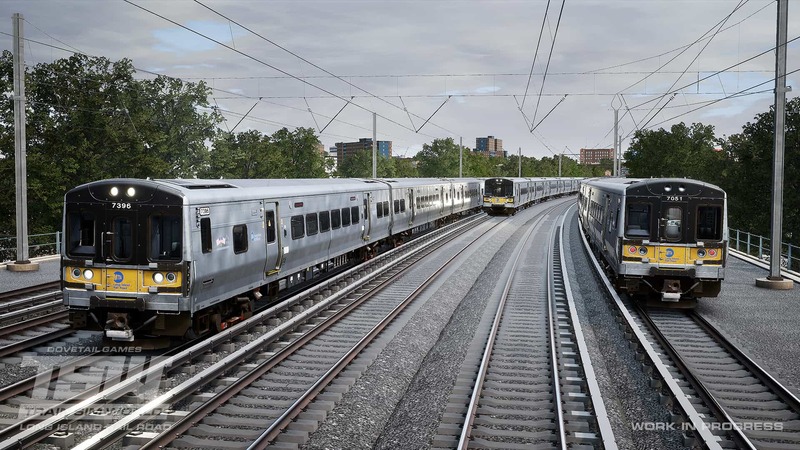 From the article it only notes the M7, it also notes the route lenght is 42 miles with 26 stations which is alot of stations to model and comparing to previous dlc's it does make sence only the M7 is included, besides they might want to hold back on other Lirr rolling stock so it can be used on future lirr routes. Very much looking forward to this route, it's good to see the Long Island Railroad added to TSW however I would have preferred more than one locomotive. The quality of the route appears to be even better than RSN from the images in the article. That's kinda why I said it was a minor flaw. The M7 is great for this, I just have a small tendency towards routes with more types of rolling stock. Nothing bad enough to stop me from buying this. The crossings are a much more pressing issue for me, but hopefully more easily fixable. As stand-alone for sure, but it's also possible they might give an option to players that own the Nec and buy the Lirr dlc as stand-alone release or merged to Nec or an option to download as 3rd route where both Nec and Lirr are merged while also having them as seperate routes, this might be possible as option through the steam workshop in the future. Remember, it’s still very much a WIP, the crossings will be fixed by the finished product. I will definitely get this! It looks very good! Well yes only 1 train can make it less interesting compared to more trains but that's an choice they made with making the route lenght/station number in order to keep it in balance with total content from previous dlc's, if they for example desided to not include an branch line which would have reduced the total amount of stations and route lenght (meaning less new 3d models, less work to create the route) they could have added an extra train to the dlc, now maybe 2 train types was an better idea but that means an shorter route). Maybe in the future if they deside to give out more content per dlc (more stations/longer route/more rolling stock) where they might also make an extension on older dlc's to get them on the same level (like they are currently doing in train simulator 2019) or reduce the price of older dlc's that give less content but till then this probably won't change. Well, while there is other equipment used in the system, the M7 is the dominant workhorse. We also have branches, which helps with variety. So while like RT, this only has 1 loco DLC, it does have branches, which gives a variety that RT or any other routes, do not offer. Those M7s look amazing! I need this! It means, that there will be just passengers scenarios? Yes, it appears there will only be passenger services in this route. Well for those of you that enjoy this type of Route I'm happy for you, but it holds no interest for me. I'm glad to see new content for TSW but I'm really disappointed that there have been no bug fixes in quite a while. Depends on how complete it is. Some parts of the screenshots still look quite work in progress so it might take a bit longer. I'd say probably either late November or early December personally. Looks neat, but neither the trains nor location hold any interest to me. I might buy the next USA DLC, if it isn't in New York. You... do know I was agreeing with you, right? Hmmmm, this'll be interesting when released. I'll be keeping my eyes on this one. Looks amazing plus it’s a hometown railroad, looking forward to this route! I have to say, the detail on Train Sim World rolling stock and route scenery is really top notch, and still, it manages to get better and better. Great job, DTG, great job. Idk if someone said this already, but if they broke up the actual LIRR routes into separate sections as DLC (Port Washington Branch, Port Jefferson Branch, Long Beach Branch, etc) that’ll be great. Since for now there’s only the M7, it would be great to have branches that have the third rail. Fingers crossed that they'll release a bugfix update at the same time, hopefully including the GWE loco fixes. They usually release a bug fix with new DLC, because Steam charges for updates. Yeah do you have any fact to back that up? Cause I find that pretty hard to believe that steam would charge developers to push updates. Luke said that at some point in the Discord server. I'm happy to see that the quality of routes keep improving, and that this dlc seems to be following that trend. I like how we don't have any idea when this route is coming out and have only known about it for a day, and yet half the forum's profile pictures are suddenly M7's. A lot of them were changed within the first few hours of its announcement. The hype is real! Exactly- and Dovetail listening to the community for once is certainly worth the hype! In all seriousness, though- between the increasing route quality, the news about the route editor, and the new loco physics, it really is starting to look like DTG is getting better at this whole TSW thing. What do you mean “for once”? They always listen. It’s the fact that they followed through with the requests he’s referring to. You’re making it seem like you’ve already tested it out and are referring people to it already lol.